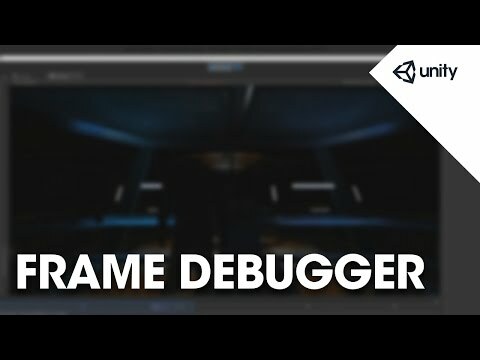 In this video we'll look at how to use Unity's Frame Debugger to analyze and trouble shoot graphical performance. occurs in a linear sequence of events. in rendering a frame step by step. that contributes to the frame, in order. in current frame will displayed. Many of these are draw called. to the GPU to be rendered as pixels for display. along with a slider, which will allow you to step through this list in order. to be drawn in the game view. will be highlighted in the hierarchy. process of drawing the frame it occurs. and their views can be expanded or collapsed. Unity is rendering your frame. can choose between 4 different render paths. Each render path renders content differently. dependent on the nature of your project. render paths please see the information linked below. to be rendered to an intermediate memory buffer. 1 render target is used by default. along with a depth buffer. This project is in differed rendering mode. In differed rendering mode multiple render targets are used. you can select which display using the drop down menu. selecting it from the same drop down. of the selected render target. display using the levels bracketed slider here. of a frame for analysis.